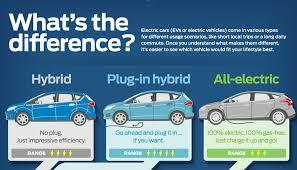 Conventional, Hybrid and Electrical Vehicles: What’s the Difference? September 6, 2017—-I drive a hybrid car and have been asked many times if I have to put gas in it. The answer is yes. The term, hybrid, has gotten more complicated in the past several years, as now there are hybrid gas-electric no plug-ins, gas-electric plug-ins and all electric vehicles. Conventional cars, which burn gas and diesel, release toxic fumes into our atmosphere, exacerbating illnesses such as asthma. Though hybrids may still leave a carbon footprint in the manufacturing process, and with the source of electricity used to energize the electric engine, they still have a future of burning clean. As solar replaces the conventional sources of power in the production of these vehicles and clean energy is produced for our power plants, the carbon footprint decreases. 1. Conventional Vehicles: Use gas or diesel fuel. 2. Hybrid no plug-in vehicles: A hybrid is a car that draws energy from 2 or more sources. These cars have a regular combustion engine and battery just like a conventional car, but they also have an electric motor and battery. They are never plugged in to outlets. According to itstillruns.com, “The Prius uses an advanced charging system that allows the battery to tap into power from the Prius’ gasoline engine while using kinetic force from braking to generate additional electricity.” The electrical engine is powered by the gas engine, plus the braking system, and kicks in when driving slowly or idling, which makes it fuel efficient and reduces emissions. These cars aren’t considered electric cars, as they rely on gas for their energy. I average about 48 mpg with mine. 3. Plug-in hybrids: These cars are considered electric hybrid cars, as they rely on a conventional outlet for power plus gas. They combine a gas engine with an electric motor and a plugin rechargeable battery. They can be plugged in to a regular 12 volt outlet, allowing then to drive miles on the energy from that outlet. When the electric battery is depleted then the conventional engine kicks in, operating on gas. 4. All Electric vehicles: The batteries of these cars are charged using grid electricity. They can use a 12 volt outlet or a charging unit, like the units Tesla has installed across the U.S. They are powered entirely by electricity. The gasoline engine is replaced by an electric motor which gets its power from a controller which is powered by the rechargeable battery. The controller takes in 300 volts DC and converts it into a maximum of 240 volts AC to send to the motor. Many people will argue that electric cars are beneficial to the environment only if the electrical source is from renewable energy. This is true, but things are slowly changing and, as our power grid across the U.S. changes, so will the energy available to the cars. Keep fossil fuels in the ground! Categories: Building Green, High MPG vehicles, Renewable Resources, Solar | Tags: #climatechange, hybrid cars, Renewable Resources, Solar power | Permalink. 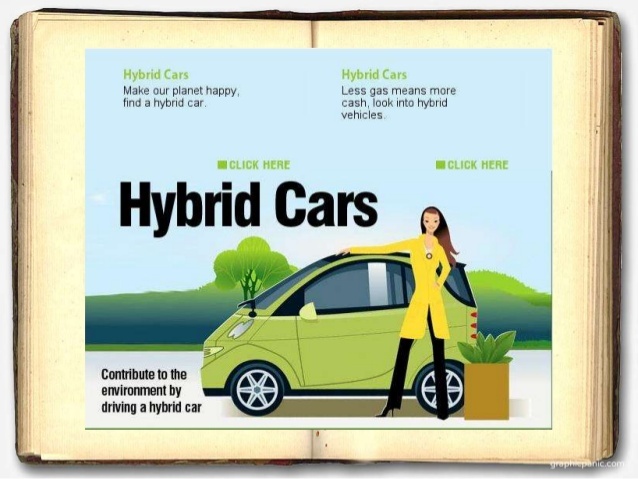 Thank you for sharing such type of informative post about the different types of hybrid cars. If we charge our cars from the electricity produced by burning hydrocarbon fuels, then it became meaningless to use electrical vehicle. According to the law of thermodynamics, there is certain amount of energy loss takes place when energy is converted from one form to another form. So, there is loss of energy as well as increase in pollution takes place at the same time. So, if we can use wind energy or solar energy for charging electrical vehicles, then it will act as a true Eco-friendly car. So initiatives should be taken in that direction. And another thing is that, the cost of EV should be affordable for general public. Thank you again for sharing such type of unique post with us.